Dialog. The focal point of any movie, television show, documentary, or for that matter, any creative media production involving the spoken word. Add to the mix a sweeping musical score, dozens of foley effects, and plenty more – and it becomes clear the job of dialog mixing is a tall order. After all, if you can’t hear what the actors are saying, why watch it at all!! The SA-2 Dialog Processor is based on hardware originally conceived by Academy Award winning re-recording mixer Mike Minkler and used on over 100 major motion pictures. The SA-2 is designed to improve the overall sound of recorded speech. But the SA-2 is not just for dialog. It’s equally useful for vocals, and is a great tool for adjusting the timbre of any track, a reliable de-esser, and a fine multi-frequency compressor, in our completely biased opinion. 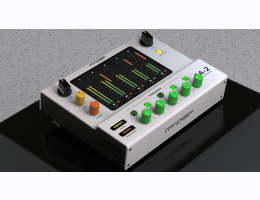 The SA-2 Dialog Processor is made up of 5 bands of strategic active equalization, configured in a variety of modes to best address common issues of dialog. Each band of active equalization has a threshold control to determine at what signal level the active equalizer begins to effect the signal. There are also enable buttons for each band to quickly audition the effect of any given band. Two mode selectors – one for controlling the ballistics of the active equalization, and a second for placing the five bands at strategic locations in the frequency spectrum. Finally, there are input and output gain controls for overall adjustment. An iLok account is required to authorize McDSP products. McDSP plug-ins require an iLok2 USB Smart Key for authorization. (iLok keys can be purchased from www.ilok.com or at your local dealer). McDSP AAX plug-ins support Pro Tools 10.3.8 or later, 11.1.3 or later, and Pro Tools 12.x or later. AAX Native (32/64-bit), Audiosuite, AU (64-bit), VST (64-bit) plug-in formats supported. PLEASE NOTE: Demos will operate for 14 days from first use.